Abhyanga or Synchronised massage subdues the ageing and degeneration process. A therapy pioneered as per the ancient Ayurvedic classics; its rhythmic motion helps to relieve joints and muscles from stiffness and makes all body movements free. This stimulating treatment increases blood circulation, which in turn encourages quick removal of metabolic wastes, while providing relief for anxiety, fatigue, circulatory disorders, rheumatic and arthritic problems, backaches and injuries. Derived from the Sanskrit words shira 'head' and dhara 'flow'; Shirodhara was developed in Kerala, India for use in restorative therapy. This therapy relieves stress and strain related problems, slows the aging process, improves memory and is known to have a curative effect for hypertension and other neurological malfunctions. It also bestows better vision, hearing, clears nasal problems and calms the body and mind. As the name already suggests, Kalari massage is essentially associated with ‘kalaripayattu’ - the ancient martial arts form of Kerala. In the ancient times, when combat situations were part of daily life, warriors needed not only a strong, but also agile body which would instantly react to the mind's signal. They needed speedy recovery from injuries so as to face the next possible opponent. Kalari massage provided the needed results in this direction by stimulating the unique self-healing nature of the human body. 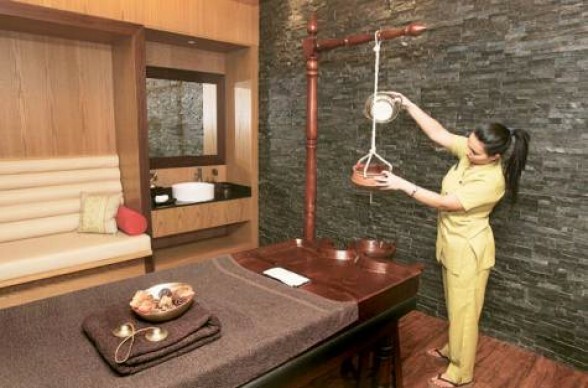 Kalari massage is done with medicated oils and herbal medicines and the Gurukkal or masseur has a different approach to each depending on the age, body type and nature of ailment of the person.